The High School Camp is specifically for students who desire to chase after the heart of Jesus and discover His delight over them. Get ready for a week full of creativity, friendship, worship, teaching and a whole lot of fun! This weekend is a time for us to unpack what it means to be children of a loving God and discover the joy of being relentlessly loved by Him! Worship will be led by Joel Case, Molly Skaggs, Chris Miller, Rosemary Skaggs and Phyllis Unkefer. Speakers include JD Gravitt, Justina Stevens, Erin Gravitt and Jessie Miller. We have experienced firsthand how powerfully the Father can meet our hearts in a simple week. Each day's schedule is full and intentionally designed for us to pursue Jesus' heart together. These six days are carved out for you to fall deeper in love with Jesus, discover your true identity in Him and experience amazing friendships! You will receive deeply from both His presence and from the joy of engaging new friendships during camp. The High School Camp is held on our beautiful 52 acres called A Place for the Heart. This land is great for coming away from the noise of the world and hearing the voice of the Father. This is where we host the 18 Inch Journey and where the Cageless Birds live and work year-round. ﻿You will be staying in great cabins and bunkhouses that hold many amazing memories from the 18 Inch Journey schools. 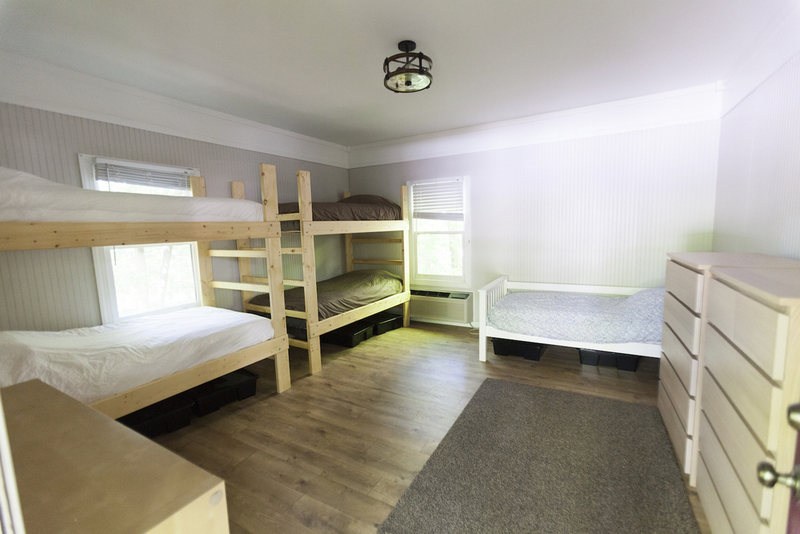 The cabins each have a ground floor and a loft with a bathroom located inside the cabin, each cabin sleeps eight. The bunkhouses each have two rooms that sleep five per room, and there is a short walk to the bathroom. All linens, with the exception of towels, will be provided in your cabin or bunkhouse. Students are responsible for arranging their own transportation to and from A Place for the Heart. Our desire is to provide and facilitate the most safe and responsible transportation from the Greensboro airport. We will provide one complimentary shuttle service run for pick-up at Piedmont Triad International Airport (PTI) on Tuesday, July 9 at 2:00pm, that will arrive at A Place for the Heart at 2:45pm. We'll also provide one drop-off shuttle run on Sunday, July 14 that will depart at 2:00pm and arrive at the airport at 2:45pm. Any students who schedule flights outside these windows will need to arrange their own transportation. If you need the complimentary shuttle service to the camp, please plan your incoming and outgoing flights to fit within this window and clearly communicate this on your camp application. It's our desire to get to know you a bit before your arrival with an application and short video. We want you to immediately feel loved and seen and the application will help in this process. Upon being accepted you will receive an e-mail including the payment method, packing list for the week and parental release form. YOU CANNOT TAKE PART IN THIS CAMP WITHOUT YOUR PARENTAL RELEASE FORM. We are accepting the first 20 female and first 20 male applications for consideration. Applications will be available until we reach this limit. We have 36 spots available for this camp. To reserve your spot for the High School Camp, we require a $75 non-refundable deposit within 10 days of your acceptance. Full tuition and your parental release form are due by April 10. If you need to cancel your registration after this date, you will receive a refund of $325. Your registration is not transferable to another event, date or person. ﻿If the event is made impossible by any legitimate cause beyond our control, we will cancel the event and gladly refund you in full. ﻿You can reach us at 18inchretreat@gmail.com with any questions about the camp. In the subject line write "High School Camp".